Intel has just announced the new name for its famous ultra low power Silverthorne processor officially yesterday. Renamed to Atom, it actually reflects the tiny silicon size that able to fits well into ultra small form factor end products. At the same time, Menlow, which is a platform that includes Silverthorne and 945GSE chipset is also being renamed to Centrino Atom for public officially. Fabricated using 45-nanometer Hi-k technology, the processor consists of over 47 milion of transistors packed inside 22 mm X 22 mm silicon size. Not to be limited by its tiny size, the Intel Atom processor is believed to deliver equivalent processing power as similar to Pentium M processor. 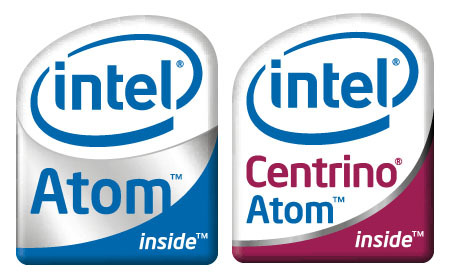 Interestingly, both the Silverthorne and Diamondville processors are also categorized under Intel Atom product name. Both are having quite a similar architecture with in order execution core that able to reduce power consumption for fanless application. On the other hand, the advanced SMT (Simultaneous Multi Threading) allows parallel threads processing on both cores that able to boost up the performance per watt significantly. Only some delta, Silverthorne will only be available in single core whereas Diamondville will have both single and dual core version for consumer selection. The new processors are expected to be launched by mid of this year. While the target segments are mainly for MID (Mobile Internet Device) and UMPC (Ultra Mobile PC), they are also suitable for low end PC like the next generation Asus Eee as well as embedded applications.